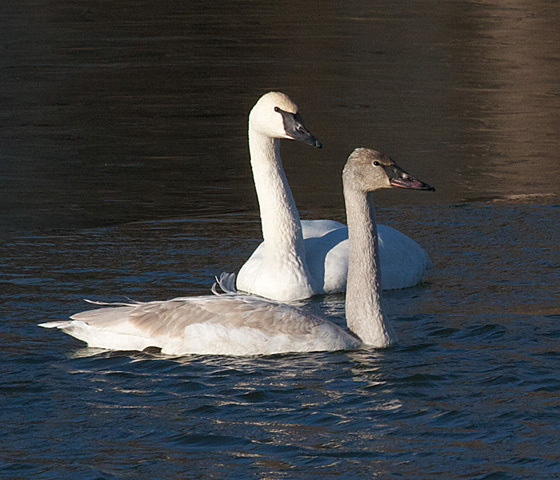 Fourteen trumpeter swans graced a Fairfield, Iowa, pond recently. One spread its wings and displayed a mighty chest. And a little closer view... The white trumpeter is an adult. The grey one is typical for the young of the year in mid December. It will also be pure white by next spring. I love the way the breeze is tickling some feathers on the young bird's back. The first optics a birder needs is a good binocular. If you then want to see birds far away, such as at a lake or the ocean, you will really enjoy a spotting scope. If you want a top quality scope but at a moderate price, we recommend the Vortex Razor. When we tested it for a review, we found it the equal of scopes costing two or three times a much. 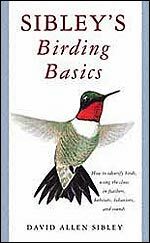 David Sibley's basics book is about the essence of birding—identification. The book is compact and easy to understand. It shows everything you need to know to identify species. When and where to look for birds. 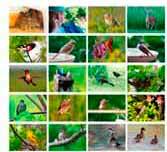 What to look for so that you can figure out what a bird is. The illustrations are clear and beautiful.